Welcome to the Great Lakes Region! 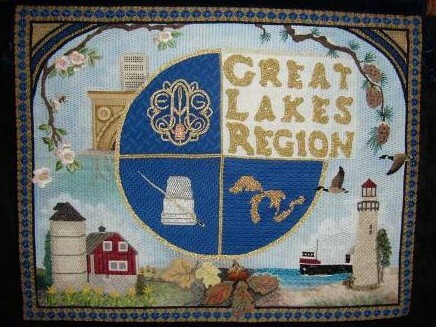 Welcome to the website for the Great Lakes Region (GLR) of The Embroiderers' Guild of America! The GLR has local EGA Chapters in Ohio, Indiana, Michigan, and parts of Illinois and Wisconsin. If you are an experienced stitcher or just starting out, you are welcome to join us! Check out our Chapters menu to find a chapter near you. If you aren't from the Great Lakes Region, check the EGA Regions list for the website of the Region nearest you! Be sure to check the Region News page for all the latest updates! There, you can find information on upcoming events as well as recent changes to the website. Also, our Calendar page has a list of upcoming events sponsored by EGA, GLR, or our Chapters. The Seminars and meetings tab has the latest info on the 2020 Spring Seminar! And Welcome to Our Website! Use the menu to the left to find out more about us! We hope that most of the options are self-explanatory. There is information about our Education opportunities, Outreach programs, and GLR Merchandise on those pages. Details about upcoming events, including Seminars and Meetings and State Days are also available. Be sure to check out the Past Events for a sample of what to expect there! Our Members Area has three sections. The Forms page has reporting forms for Dues, Outreach and Reimbursement and Income, as well as the Release Form for publishing personal information on the website and in the newsletter. The Website Updates page has information on what is required to request updates to this website, along with guidelines as to when the Release Form is required. The Newsletters & Documents page contains links to documents that contain sensitive contact information, such as the Chapter Officers List. Our Newsletters can be found on this page. The page uses a security challenge to prevent web reading programs from harvesting e-mail addresses and other contact information. We welcome your suggestions on how to improve these pages! EGA Policies require a signed release form for personal and copyrighted information posted on the website. The GLR banner was designed by Charlotte McDonnell and stitched by members of the Monguagon Chapter.